Capital S.M.A.R.T team member Mario Andreacchio has completed his first City to Surf event raising a significant amount of money for Charity in the process. 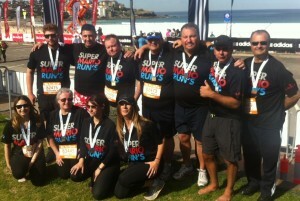 Mario and team mates from Capital S.M.A.R.T in Sydney completed the fourteen kilometer fun run, which is held annually in Sydney on the second Sunday in August, with more than 83,000 competitors taking part this year. Capital S.M.A.R.T Founder and Chief Operating Officer, Jim Vais, said Mario’s effort as a first time competitor was an inspiration to everyone at Capital S.M.A.R.T. “We are very proud of our team and Mario and their decision to take part in this iconic event. Fourteen kilometers is a long way and their enthusiasm reflects the community spirit that is part of the Capital S.M.A.R.T culture.” Mario and the team, will donate all funds raised to the nominated charities of the event including The Diabetes Australia Research Trust (DART) which supports Australian researchers, who are leading the world in research to prevent diabetes.